Sometimes I wonder how one reasons. 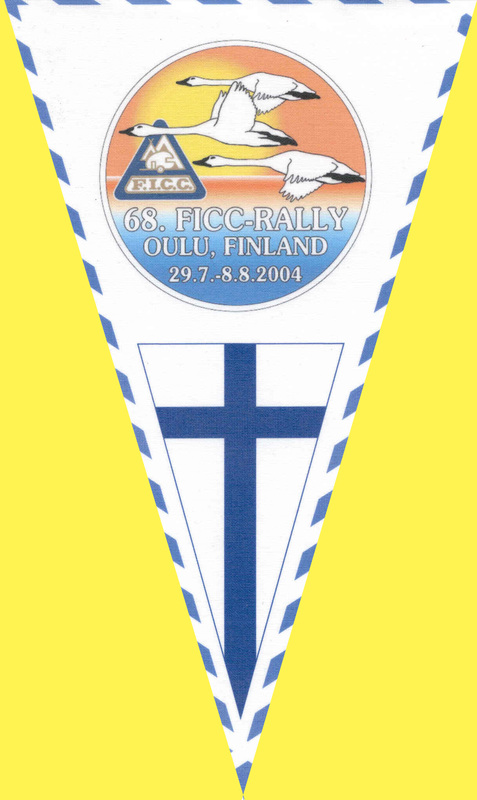 The first thought that got into our minds when we heard that Oulu should be host for the 2004 FICC was: But it is so far away! It is not that far away, if you compare with last years trip. It is only Sweden that is long. The PC is a company this year as well. But should we really have to? Well, it is only the E4 northwards and then around the "bend" and we're there. 23/7 We leave a half sunny Bålsta about 1. And about 1/2 past 3 we are at Engesbergs Camping outside Gävle and now it is not half sunny anymore. The sun is blazing hot. We are not use to that. The campsite is quite nice, and it's been a long time since we stood below pine trees. There is a small beach as well, used by the puplic too. 24/7 Since we are in Gävle today alson, we have to visit the largets railway museum in Sweden, that is Sveriges Järnvägsmuseum. Nice exhibition with real steam engines. The Swedish steam engine that raced the English one, sometime in the 1900's was here as well. 25/7 Today we haven't planned the stop for the night. We just goes. Passes the Höga Kusten bridge. That's some piece of engineering! We misses the entrance to Skulebergets Camping and continues. We see a sign to a campsite south of Örnsköldsvik, so we follows that. After a while on country roads (not bad, but narrow and curved), we arrive at Kornsjögårdens Camping. Rather wet in the ground, dispite the slope, but with a 4WD it's ok. Here we have to speak English (or German) because the warden doesn't speak Swedish. He complaints a bit of the few camping guests (caravans & mobilehomes) but all the cottages are full. He even has a pub and you can order breakfast if you wanted to. The sanitary rooms are splendid. Before nightfall there are 4 caravans staying the night. 26/7 When we pull up the curtain around 7 in the morning, a mobile home leaves the area. Wonder if he told the warden that he had stayed there? Goes on northwards and ends up in Camp Arcus in Luleå around 2. Since it's been raining a bit, we choose a place with half concrete and half grass. Cheaper than to stand on only grass. Peculiar. Opposite the camp site is the MBVs museum, that its MalmBanans Vänners museum (the train of the mining company). It is not big but nice. No steam engines here. 28/7 Today we will not visit a camp site. We will stand on a resting/parking area called Kerräsjoki, situated on the east side of E4 a little south of Haparanda. We are not the only ones here, that is going to Oulu. We've been wondering where all the reindeers are. Shall we complain at the tourist office? We haven't seen one. Sunshine all day and not very many mosquitos. 29/7 Passes the boarder to Finland around 8 and here we change driver. And suddenly we remember! The time! We are in Finland, so now the time is 9 (not 8). At around 11 (Finnish time) we have reached our goal. And we think we've probably got the best area this year. Close to the swimming pools, Ouluhalli and the shopping centre (with 3 large shops). 30/7 The body (or the head) doesn't understand this with Finnish time. We usually get up around half past 8 when we're of duty, but here the time is near 10 then! Takes a walk to the shopping centre and shops a bit. You have to check on the prices. Hmm, it is not more expensive than home. In the evening there the usual "long table", and the delegates gives us information. We're sitting in the sunshine and all feels very good. 31/7 Today it's opening day and we almost misses it (due to the time). We walk almost through all Oulu and it is warm and the sun's blazing. We don't care about the speaches, so we stumbles home in the heat. 2/8 Today it's info giving time by the bill board in drizzling rain. 2007 Ireland, Millstreet and 2008 Netherlands. 2005 and 2006 we already knew about. Information from Italy on paper will arrive later on this week. In the evening, the currents begins to fail us. Not only us of course. Somebody must be freezing and put up the heat to much (1000W ok, 3000W no). 3/8 The thunder wakes us today, so we are up by half past 8 Finnish time. You can't sleep while the rain drops down on the caravan likes grabble. And this evening is the Swedish Evening! Takes a walk to Ouluhalli to post some postcards and finds papers about the Italian rally. Very nice, home quickly to study. It's gonna take money, a hold lot of spending money (as George H sang), if you want to go on excursions and so. But it probably be safer that way, than taking your own car. Our friend Tom invites us to take part in the Swedish Evening together with other friends of his (from England). Pea soup and Swedish Punsch as usual. And very nice. 5/8 Today we leave to go sightseeing in Sweden for a while. When we stops for a breake on road 99 north of Haparanda the thermometer shows 26 degrees Centigrade. Have arrived at Bohedens Camping about half past 2 and it is even warmer. The lady warden has had a thermometer in the water and it showed 25 degress Centigrade. That's right, twentifive degres Centigrade! This is a very lovely place to stay at. The people are very friendly and the telephones are not working. We have the wrong operator. Even Inger dare to take a swim in Djupträsk, which is a part of Kalix river. 6/8 Takes the car to Överkalix for some shopping. PG on the camp site had told us that we had to go up on the Brännaberget (Bränna mountain) to check out the view over the forrest and water, so we did that on the way. And when we get up on the top of the mountain there is a reindeer! And the camera is almost under the seat in the car! The reindeer doesn't like us, so he trotting away into the forrest. It was a marvelous view from the mountain. See photo. 7/8 Now we head up farther north, well it's actually north west towards Gällivare and on the way we count to 9 reindeers and 2 dead ones. In Gällivare head south towards Jokkmokk and before we arrived there we had spotted 19 reindeers (live ones). Not that much. We had thought that it would be more of those wandering reindeers. The camp site is nice, lots of things for children to do. Several swimming pools to use, if you didn't want to swim in the river. A restarant in walking distance and in the reception building a hot dog stand. There was one thing bad about the camp site and that was ... the berry pickers. In a shop in Jokkmokk we buy Jokkmokksfalu. The "butcher" says that it is more meat in this sausage than the ordinary ones (Falukorv that is). And he was probaly right, it tasted marvelous. 9/8 Continues down south and it is so beautiful a long the way, but it gets rather long between houses. End up in Doro Camp in Dorotea. This camp site is almost as nice as the one in Boheden. Here is a little lake to swim in with bridge, and a restaurant (or was it a café?). Some pitches was terraced, other was on ordinary ground. Here was a boarder collie (?) that was not like other dogs. He guards the children on the bridge! But to so he can rescue them if the falls in the water, no no. When he thinks the children has been too long on the bridge, he runs out and chases them into the water. Then he returns to land to keep the watch. What a dog! Kent usually gets along very well with dogs, no matter what race they are, but with this one he never got contact. The dog just stepped out of the way so he had a clear view of the bridge and the children. 10/8 Takes a tour in the Polar museum. It is fun to look at old caravans. 11/8 Continues our way down south and in Hackås we finally get contact with our telephone operator. Just as long as we have time to call the son at home and tell that we will be home tomorrow. Stops in Sveg for the night. We almost couldn't find the camp site due to major road works. Buys pizza in the restaurant Björnen (the Bear) which is next door to the camp site, and eats it in the caravan. Yummi! 12/8 Now it is beginning to be a bit cold in the mornings. Only 11 degrees Centigrade beneath the caravan. Inside we had 15, we forgot to put the heat on. At 14.30 we are home again in Bålsta. It has been a nice and not particularly expensive holiday .